Raif Badawi’s third year imprisoned for “insulting religion” begins in Saudi Arabia. There’s movement, but worrying signs, in the trial of four Coptic Christian teenagers accused of “mimicking Islam” in Egypt. Pakistan is, maybe, edging toward reform, but Islamic clerics are fighting to preserve Pakistan’s blasphemy laws in no uncertain terms (“those who insult the Muslim prophet Muhammad deserve to be killed”). 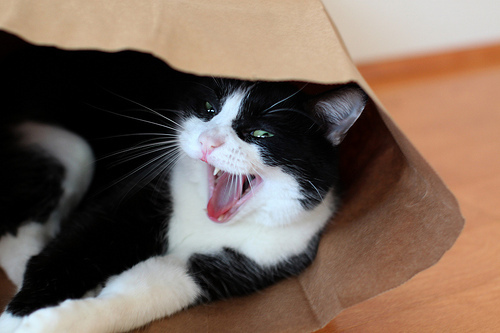 And following a concerted effort by Christians offended by cat-based religious imagery, heretical “Virgin Meowy” socks have been clawed from sale by their online retailer, PacSun.com. This is your 20th weekly round-up of “blasphemy”-related news and views. 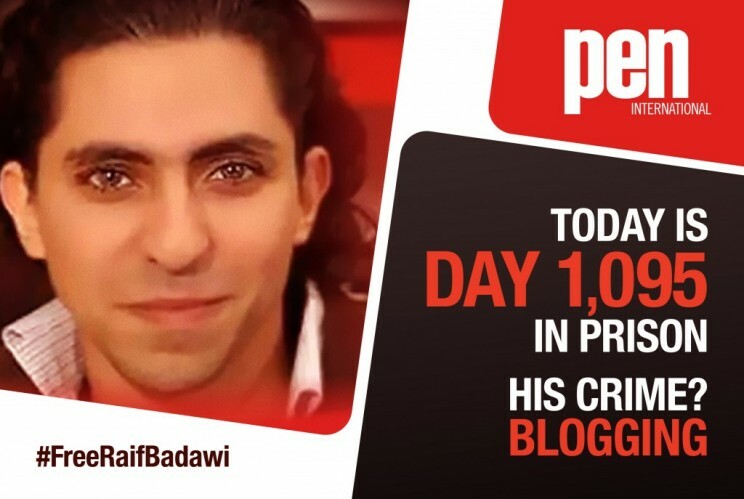 PEN International reports on protests, of which it was among the organisers, against the continued political imprisonment of Raif Badawi on charges on “insulting religion” in Saudi Arabia. 17 June 2015 marks three years since the arrest of activist, blogger and editor Raif Badawi in Saudi Arabia. Three years later he remains in prison for peacefully expressing his opinions and is facing 9,950 further lashes. Raif Badawi had spent almost two years in prison before being convicted in May 2014 of ‘insulting Islam’ and ‘founding a liberal website’. He received a fine of 1 million riyals (approximately $266,000), a ten-year prison sentence and 1,000 lashes, to be administered each Friday after noon prayers. There’s also a petition at the link. On 17 June, more than 50 supporters gathered in Whitehall to deliver a letter to David Cameron. Our director Jo Glanville was joined by comedian Kate Smurthwaite, activist Peter Tatchell and a cross-party group of MPs and peers. We also had a great turnout for our evening event at Portcullis House, where we were again joined by Green Party leader Natalie Bennett, Stewart McDonald MP of the SNP, and Labour’s Sarah Champion MP, all of whom pledged their ongoing support to Raif Badawi and his lawyer and brother-in-law Waleed Abulkhair. Stewart McDonald has already done as promised, asking the Leader of the House for an unequivocal statement calling for Raif Badawi’s release. Meanwhile, our mass social media message reached over 1 million people. It seems that the ongoing campaign is finally beginning to take its toll. Last Friday, 12 June, the Saudi Embassy in London finally released a statement, declaring that it hasno tolerance for foreign entities meddling in the Kingdom’s internal affairs. The Kingdom will not tolerate such outrageous, ridiculous interference in its sovereign criminal justice system. Whilst the statement unequivocally condemns ‘foreign parties intruding into its internal affairs’ it also suggests that the authorities are not entirely impervious to pressure. But there is still a very long way to go. The 17-year-old student from Upper Egypt was released after 62 days in prison, subject to the payment of 10,000 Egyptian pounds, equivalent to several months’ wages by local rural standards. The boy is following a complicated, often hard-to-predict legal path together with three fellow Christian students and their teacher, who have slipped into a maze of events for having “mimicked” Islam. As a result, a series of riots and death threats have dogged the boys and their families as well as other Christians in Al-Nasriyah village. In April, the attacks came after a 32-second video apparently showing them deriding the atrocities against Christians, under a cover of piety, became public knowledge. The boys had to be delivered by their parents to the police station earlier in April, following violent protests by angry Muslims in which homes were attacked and demands were made that Christians be banished from the area. On April 17, a “Customary Reconciliation Meeting” condemned the actions deemed insulting to Islam and formally banned the teacher, Gad Younan, from the village, World Watch Monitor reported. However, in the cases of sectarian attacks against Copts, they have often been used to deprive them of recourse to Egypt’s justice system, which itself has been subject to criticism by international human-rights organzations. To date, no rioters have been arrested. The charges against the five Christians have not been dropped. … Gad and the boys’ woes started after his personal memory card was found by a Muslim villager who spread the footage among locals. The ongoing turmoil saw the five arrested, with the public prosecution intent on following on with more serious charges. The teacher’s lawyer, Maher Naguib, told Mideast Christian News that keeping the students in prison for so long did not serve the investigation – which had already completed with no more witnesses to question. It was intended to humiliate them, he said. “If he then considers it a case of ‘insulting and defaming Islam,’ the verdict will be very bad,” Naguib added. The footage references the beheading of Christians, including 21 Copts, on a beach in Libya, depicted in a video released by the so-called Islamic State. Videos deliberately produced and distributed by IS often contain extended theologically based diatribe against Christianity and Christians. For weeks Gad has lived in hiding with his wife and children. A close relative contacted by World Watch Monitor said the teacher was suspended from his work, while his wife also is jobless. Their children have been unable to go to school. Accusations of “blasphemy” continue arise in Egypt nearly two years after Abdel Fattah el-Sisi rose to power, first driving the Muslim Brotherhood out of office, and then outlawing it. The official religious establishment in the country, topped by the Islam’s leading religious institution, Al-Azhar, is pressing for an “international law to criminalize contempt of religion,” which would spread the application of anti-blasphemy laws around the world. 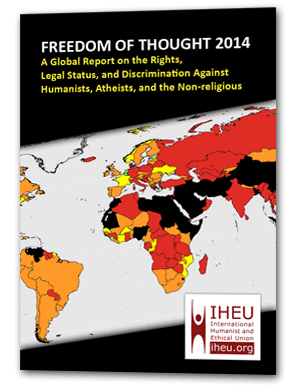 As in other Muslim-majority countries, minorities and free-thinkers tend to be the most frequent target of blasphemy charges. …10 Muslim scholars and a former Pakistani judge gathered recently at a “seminar for protection of the prophet’s dignity” and expressed their concern over the proposed legislation that is attempting to add the word “intention” to the nation’s blasphemy law. … In many circumstances, religious minorities are accused of blasphemy and are either sentenced to imprisonment, death or are beaten, burned and or killed by angry Muslim mobs who use the law to try and justify their malicious actions. 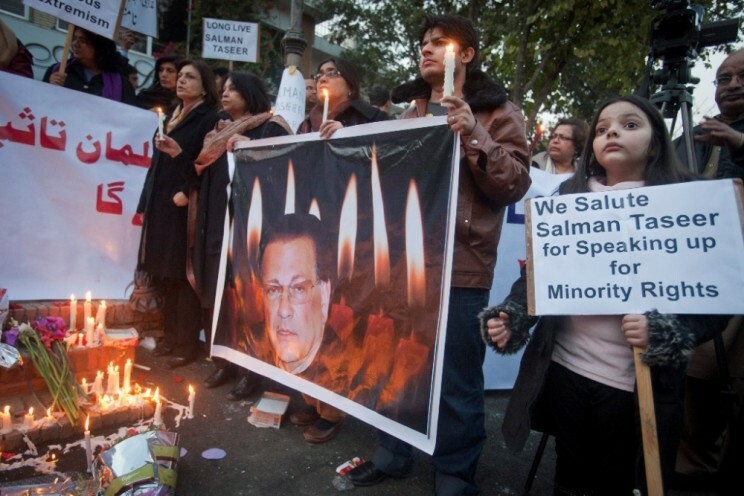 … Over 40 Pakistanis are sitting on death row or have been sentenced to life in prison because of blasphemy accusations. Bishop Michael Nazir-Ali writes on the betrayal that is Pakistan’s “blasphemy” law and the wider persecution of Christians and other minorities in the country. To be fair, the founders of the country were inspired by nationalist ideals which sought a homeland for the Muslims of South Asia but also included any minorities living within the boundaries of the new nation as equal citizens. They were definitely not theocrats. However, almost from the beginning there has been incessant pressure from radical Islamists to turn Pakistan into a theocratic state where Christians and other minorities were reduced to being dhimmies (a medieval term for conquered non-Muslims, subject to their own laws) under Shari’a. This campaign came to fruition under The Presidency of General Zia ul Haq and his programme of ‘Islamisation’. Not only did this programme enforce Islamic penal law and restrict the freedom of women, it severely restricted the rights of non-Muslims in terms of giving evidence in the courts in certain cases and in access to equal opportunity. …Amendments to laws on incitement to religious hatred – originally enacted by the British – brought into existence the notorious blasphemy laws which now prescribe a mandatory death penalty for blaspheming the Prophet of Islam and life imprisonment for desecrating the Quran. Numerous Christian, Ahmadi and even Muslim people have been accused of these crimes and convicted, though, thank God, none has as yet been executed. Very often the allegation is made to settle personal scores in property disputes or to silence ideological opponents. Once an allegation is made extremist mobs, nurtured on texts of hate, pressurise police and judiciary to obtain a conviction. Even judges have been murdered for daring to resist such pressure. These laws have not just muzzled freedom of belief and of speech but they have made Christians and other non-Muslims perpetually fearful about being targets of the next accusation. It has created a ghetto mentality amongst them and further removed them from the ambit of public life. The removal of the moratorium on the death penalty, ostensibly to deal with terrorism, raises the real prospect of someone now being executed for blasphemy. This would be a tragic development indeed. Yeah, you read that right, according to ChurchMilitant.com, which seems very pleased with itself. The anti-sock-based blasphemy campaign blog pictures a small version of the socks. But here they are (right) in all their feline glory. It’s blasphemeow! 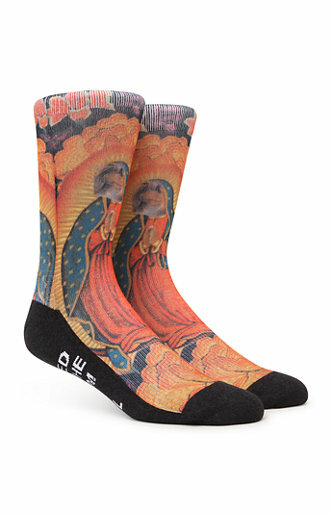 Clothing retailer PacSun has pulled a pair of blasphemous socks titled “Virgin Meowy” that depict the Virgin of Guadalupe with the head and paws of a cat. PacSun is proud to be a retailer that supports a unique collective of brands. Our brands take inspiration from a variety of influences including music, art, fashion, and action sports. The result is a creative and diverse expression both in product and marketing. While customer feedback is greatly appreciated and important to us, we remain committed to the selection of brands and apparel available in our stores. Dissatisfied with this answer, the woman sent it to America Needs Fatima (ANF), an American campaign of Tradition, Family and Property (TFP). ANF immediately created an e-mail protest in an attempt to petition PacSun to remove the blasphemous socks. Well, of course they would. Jump to attention! What more pressing moral issue could there be than Virgin Meowy socks? Obviously no one will actually respond to such a pointless email campaign though, right? The internet link that directs to the purchase page for the socks on PacSun‘s online store has been re-routed to the socks page where the “Virgin Meowy” socks are nowhere to be found. Praise the Lord! And don’t you worry, po-faced ChurchMilitant.com has checked and double-checked that the impurrfect socks are expunged from the internet. What else would he be doing with his time? To confirm the socks were totally recalled, I placed a call to a PacSun store in the Detroit area to see if any of the socks were being sold in the store. The man informed me there were two left in stock, but the computer listed them as “transferring” out the next day. Riveting. But let’s pursue this through to the bitter end though, right. Someone must get the blame! Though I don’t believe PacSun’s design department was malicious in its intent, reprimands should definitely be forthcoming from company higher-ups. Despite this event’s being very offensive to Catholics — and Christians in general — kudos are in order to PacSun’s regional directors for taking swift action to correct the situation. Yeah, or to sacrifice someone’s little kitsch design on the altar of ideological offence at the first opportunity. And oh my god ChurchMilitant’s not even done yet. Allow him to explain. All images of the Blessed Virgin Mary are honored and venerated by Catholics worldwide. The Virgin Mary is the Mother of Our Lord and the Queen of Heaven and Earth. Because the Catholic Church reverences images of the Blessed Virgin Mary as sacred, any mockery, cursing or desecration of an image is considered blasphemy, a grave sin. It’s enough to give you paws for thought.